In 1843, her father experienced financial difficulties and sent her to work as a servant for four years in Damascus at the home of Assaad Al-Badawi, of the Lebanese Nationality. Rafqa became a beautiful, pleasant, humorous young woman, pure and tender with a serene voice. 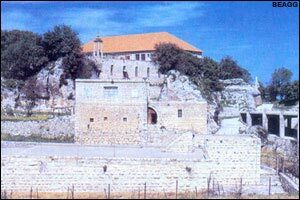 When the Lebanese Maronite Order decided to build the monastery of St. Joseph al Dahr in Jrabta - Batroun in 1897, six nuns - presided by Mother Ursula Doumit - were sent to the new monastery. Rafqa was among them. In 1899, she lost the sight in her left eye and became paralyzed. With this, a new stage of her suffering began, intensified by the dislocation of her articulations. She spent the last seven years of her life lying on the bed, only on the right side of her body. She could not move. There was a very big injury in her left shoulder and she used to repeat: "For the wound in the shoulder of Jesus". Her vertebras were visible through her skin and her body was very light. She became like a skeleton covered by skin. Her hands stayed intact; she used them to weave socks. Although she was blind and paralyzed she kept smiling and thanking God for His grace of letting her participate in His Passion. Her face reflected peace and tenderness until the end of her days. On the 23rd of March 1914, supplied with the Holy Sacrament, she called upon Jesus, the Virgin Mary and St. Joseph, then she rested in peace after a life of prayer, service and years of unbearable pain. She was buried in the monastery's cemetery. A splendid light appeared on her grave for three consecutive nights. With the intercession of St. Rafqa, Our Lord made lots of miracles and blessings.